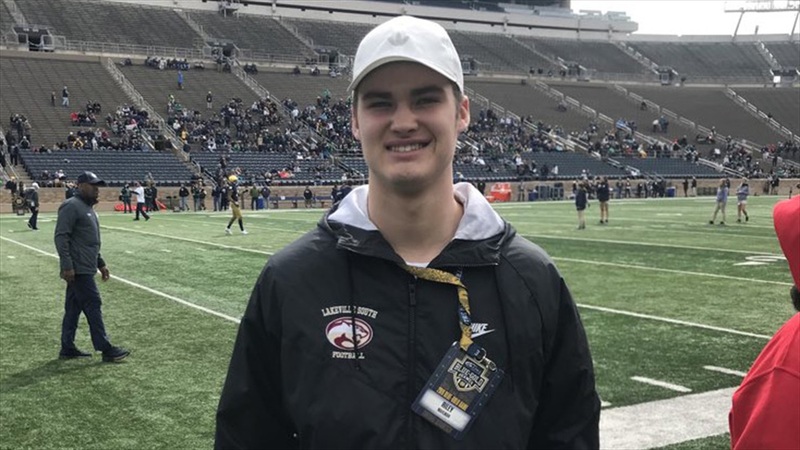 After checking out Notre Dame for a game last fall, Riley Mahlman‍ was back in South Bend for Saturday’s spring game and already has plans to return again soon. The 2021 Minnesota offensive lineman was at the Irish’s opener against Michigan back in September and enjoyed his trip back. “It was great,” the 6-foot-8, 265-pound sophomore said. He was impressed with the atmosphere around campus for the game. He also had the chance to speak with multiple members of the Irish staff. Quinn talked with Mahlman about the history and makeup of the Irish offensive line. “I really like him,” Mahlman said of the Notre Dame offensive line coach. Rees wanted to introduce himself before heading to Lakeville South High School during the May Evaluation Period. Mahlman camped at Notre Dame last summer and will be back again in June. He has early offers from Nebraska, Iowa, Iowa State, Northwestern, Wisconsin and Minnesota. “It feels great,” he said of the early offers. His next visit is a trip to Wisconsin next weekend.